“Titan is a very interesting moon because it has this very thick atmosphere, which makes it unique among moons in our solar system,” said Dr. Kelly Miller, research scientist in SwRI’s Space Science and Engineering Division and lead author of the study. “It is also the only body in the solar system, other than Earth, that has large quantities of liquid on the surface. Titan, however, has liquid hydrocarbons instead of water. 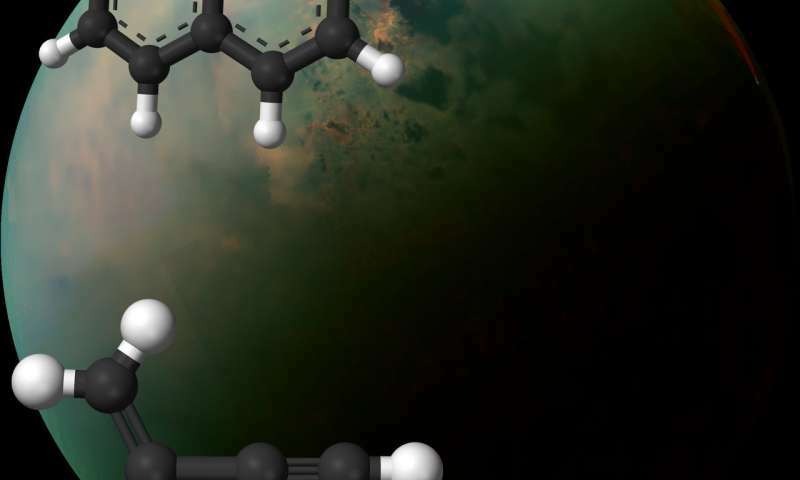 A lot of organic chemistry is no doubt happening on Titan, so it’s an undeniable source of curiosity.”A new Southwest Research Institute study tackles one of the greatest mysteries about Titan, one of Saturn’s moons: the origin of its thick, nitrogen-rich atmosphere. The study posits that one key to Titan’s mysterious atmosphere is the “cooking” of organic material in the moon’s interior. The atmosphere of Saturn’s largest moon is extremely dense, even thicker than Earth’s atmosphere, and is comprised mainly of nitrogen gas. Another odd aspect of Titan’s atmosphere is that it’s also about 5 percent methane, which reacts quickly (by astrophysical standards) to form organics that gradually fall to the surface. As a result, the atmospheric methane would either have to be replenished somehow or this current period of time is simply a unique era for Titan. Miller’s investigation was spurred by data from the Rosetta spacecraft, a European Space Agency probe that studied the distant comet 67P/Churyumov-Gerasimenko with NASA participation and delivered the surprising discovery that the comet was roughly half ice, a quarter rock and a quarter organic material. To study the Titan mystery, Miller combined existing data from organic material found in meteorites with previous thermal models of the moon’s interior to see how much gaseous material could be produced and whether it was comparable to the atmosphere now. Following the standard rule of, “If you cook something, it will produce gases,” Miller found that approximately half of the nitrogen atmosphere, and potentially all of the methane, could result from the “cooking” of these organics that were incorporated into Titan at its very beginning.